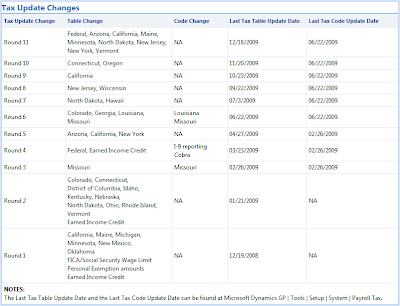 Microsoft has released the 2,010 Payroll Tax Updates - Round 1, available for download un CustomerSource and PartnerSource and has communicated that Round 2 will be out the week of January 18th to include changes to Rhode Island and EIC. As many of you have been sending comments and emails about Payroll Tax Updates and Year-End procedures, here is a compiled list of resources for both US and Canada. * The following is the complete list of Payroll Tax Update rounds for 2009. Please comment back with your own tips or issues found during the closing process. Finally, backup, backup, and backup at each step of the way. Why my PO Number seems to skip randomly?